Castillonais (also known as Cheval Ariegeois de Castillon, cheval du Biros, or Saint-Gironnais) horses are an ancient breed of small riding horse from the Ariege departement of southwestern France. Castillonnais horses originally were bred for cavalry, agriculture, and driving. They declined in population during the 20th century, and almost became extinct. In 1980, a group of supporters began to work to save the breed, and a breed association, now called the Association Nationale du Cheval Castillonnais d'Ariege Pyrenees (ANCCAP), was formed in 1992. The breed was officially recognized by the French Ministry of Agriculture in 1996. The French government, breed association and a regional conservation group all now share an interest in the preservation of the breed. Population numbers are still quite low, and inbreeding is a concern. Their phenotype is currently in flux, but overall they resemble Merens horses. 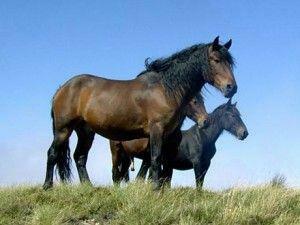 Enthusiasts are breeding for a rustic mountain horse, of medium size, with good gaits and good temperament. Some members of the breed closely resemble Iberian horses such as Andalusian horses. The official breed standard calls for a moderately long neck and long, sloped shoulder, broad back, rounded croup and muscular legs. Castillonnais horses range from 13.1 to 15.1 hands (53 to 61 inches, 135 to 155 cm) high, with the ideal height for mares being 14.1 hands (57 inches, 145 cm) and 14.2 hands (58 inches, 147 cm) for stallions. Two colors are allowed in the breed: dark bay and black, both with pangare modification, which results in paler color around the eyes and muzzle and on the underside of the body. Horses of any other color are prohibited from entry into the studbook and all horses are genetically tested to officially determine their color before they are allowed into the studbook. The breed is considered to be an easy keeper, with an easygoing temperament. The horses are agile, sure-footed on mountain paths, and exhibit extended gaits, with strong engagement of the hindquarters.